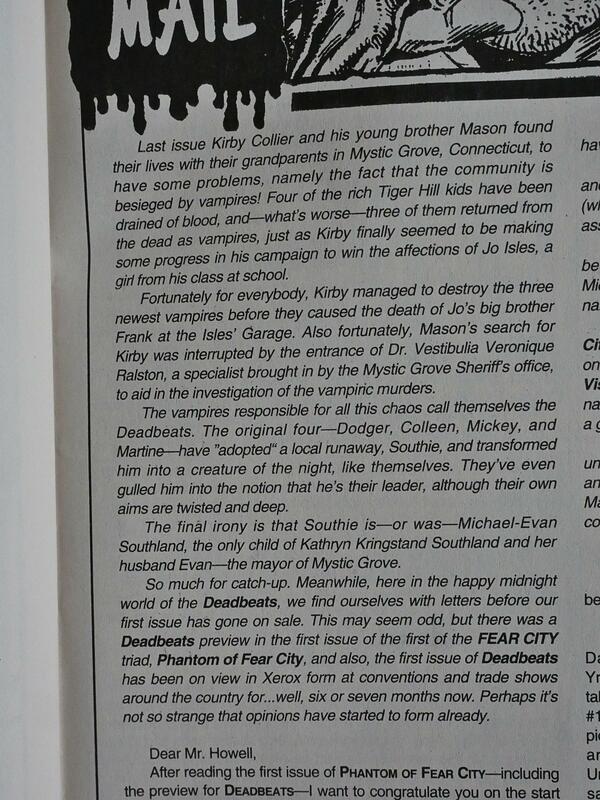 Deadbeats (1993) #1-6 by Richard Howell and Ricardo Villagran. This is the fourth and final Claypool Comics series that Eclipse Comics distributed/co-published/whatever during Eclipse’s waning days. If it hadn’t been for these comics, Eclipse would have published virtually nothing but trading cards (and other collectables) during the last half of 1993 into 1994. The Claypool series have been more miss than hit, in my opinion. Elvira was surprisingly fun, and Soulsearchers had its moments, but the other “serious” series, Phantom of Fear City, wasn’t much cop, so I read this book with low expectations. And those expectations turned out to be prescient. The obvious comparison for this series is the Buffy the Vampire Slayer movie which had been released a year or two before this comic book. While the vampires in the TV series were more… sympathetic…? 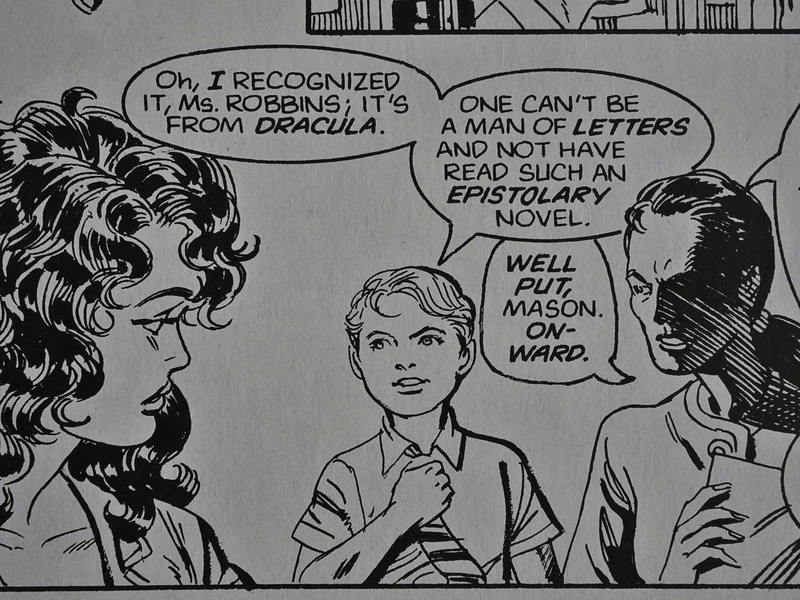 the vampires here are over-the-top evil and grisly and spout lines that’s hard to tell whether are supposed to underscore that evil or be… funny? We also get a really extended torture scene later, but then again, everything in this book takes forever. 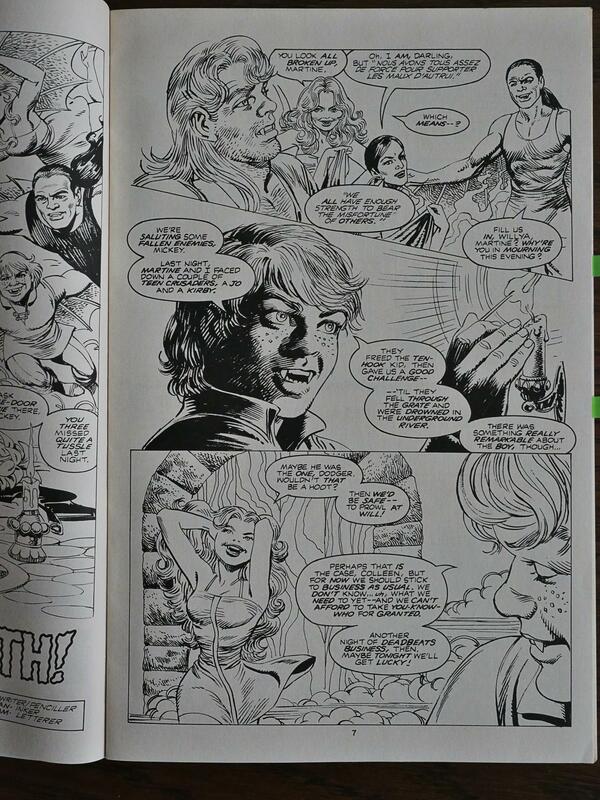 Writer/editor Howell was probably best known for his Portia Prinz of the Glamazons series back then. It was also extremely wordy, and had several characters that talked in exactly the same convoluted way. Howell continues where he left off, really, with half the characters spouting in-credible sentences, while a few of the other characters make fun of the excessive erudition. The characters also have a tendency to state, out loud, to the other characters, what their motivations are. I guess that’s… efficient? 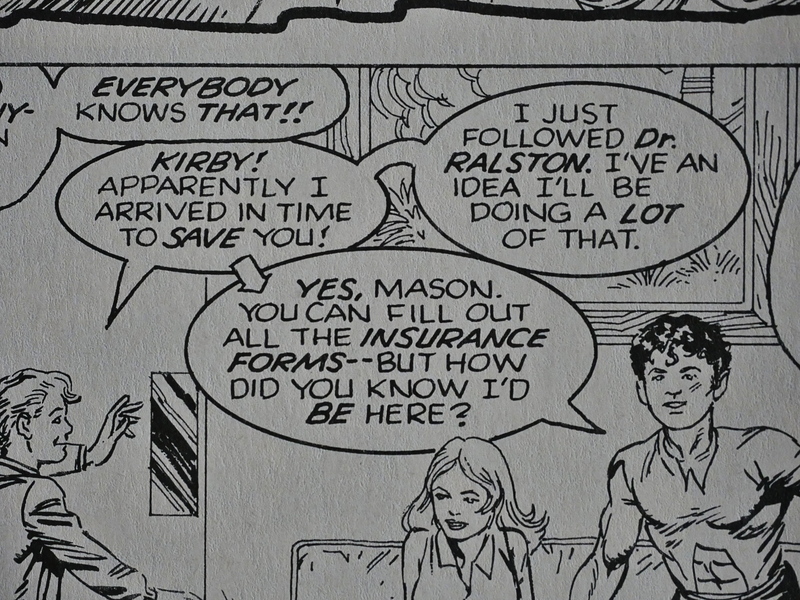 The poor letterer has huge problems fitting all the speech balloons in, and getting them to read in a natural way. Several times an issue I had to backtrack to read the dialogues in the intended sequence, so perhaps he should have used the arrow trick more often… although in this instance, it seems rather superfluous. 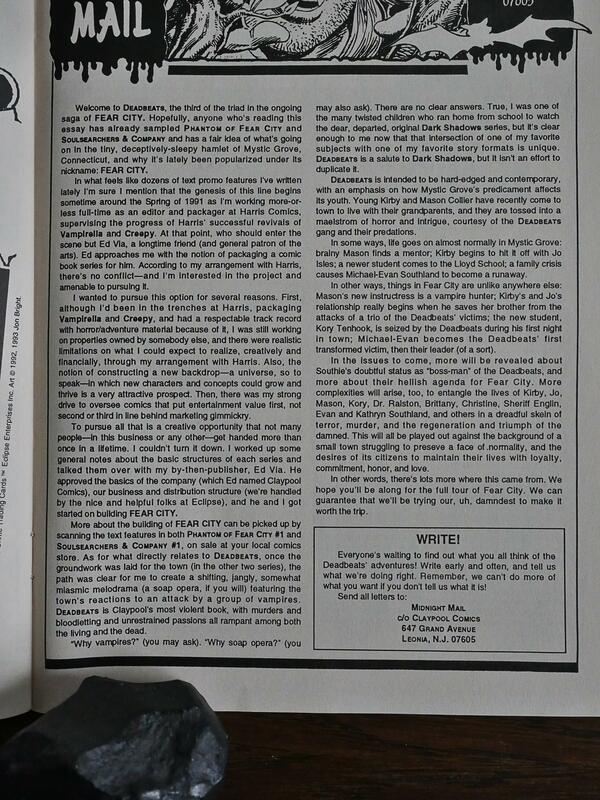 And as always in these Claypool comics, editor Howell writes an essay about how the comic came to be. This time, the rationale seems straightforward enough: It’s a soap opera with vampires. 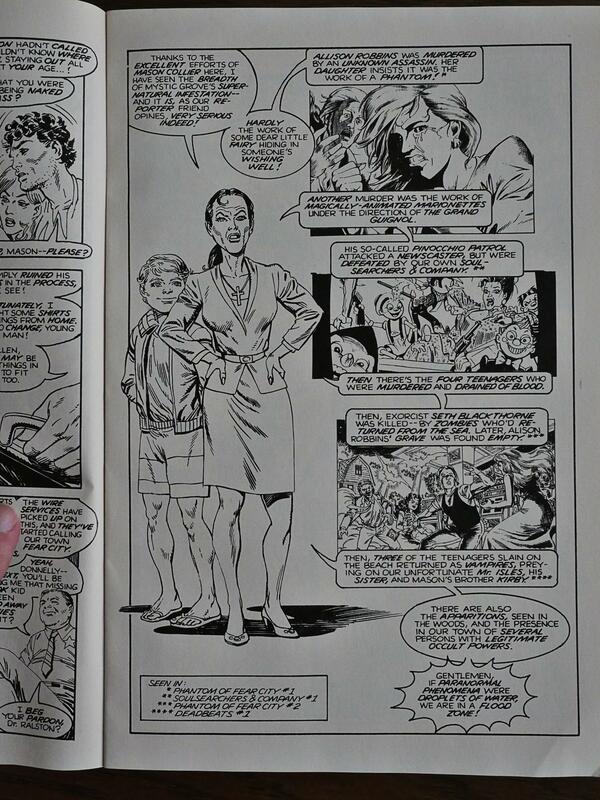 Eclipse distributed this comic, but that can mean a wide variety of things. Here Howell thanks them “for help with production, typesetting, press coverage, printing, and punctuation”. 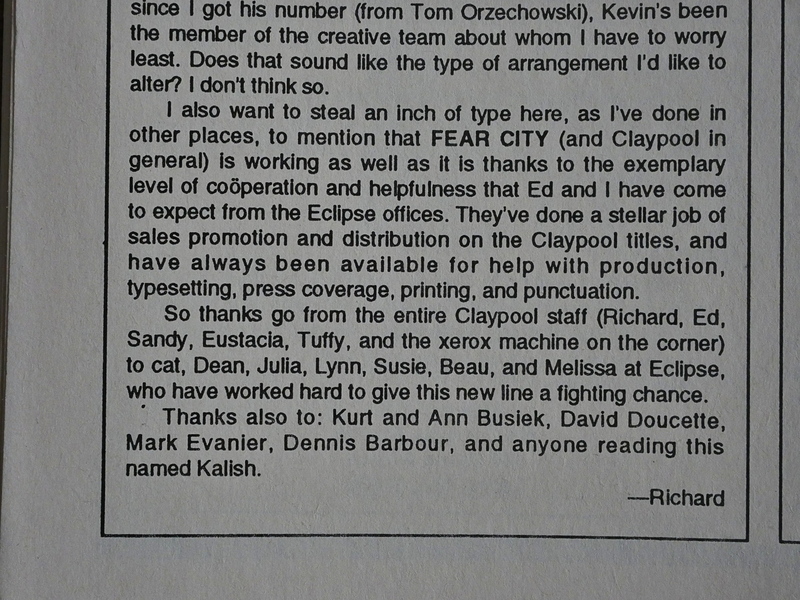 So I guess Claypool handled the editorial bits, and Eclipse did all the practical things, including readying the comic for the printer? It’s a large cast, but I have to say that Howell handles that admirably. 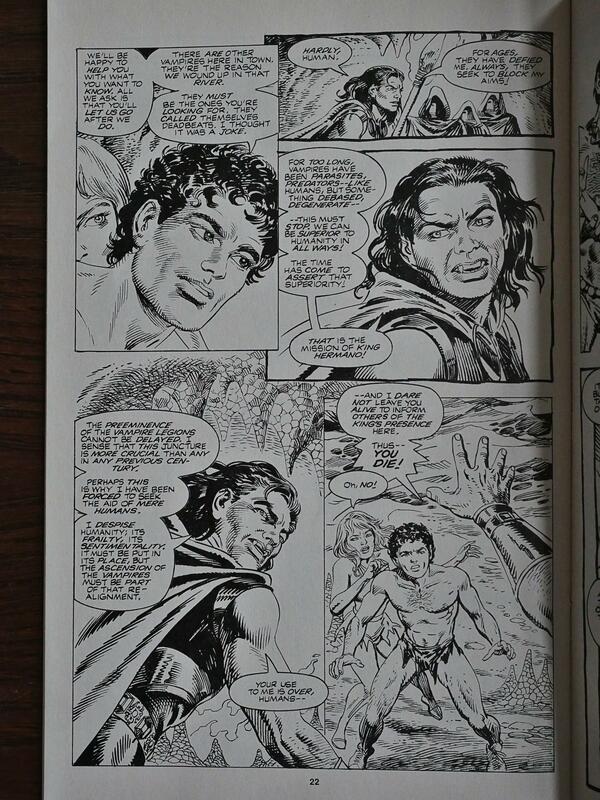 He’s also helped by having some diversity to his character design (although not much diversity otherwise), and Villagran does a professional inking job. But skimp out on backgrounds now and then. 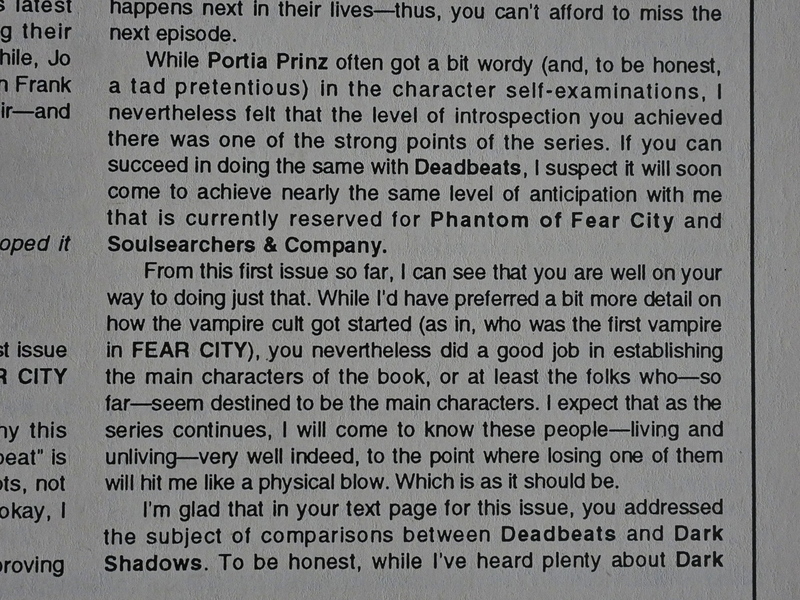 There are three comics set in the “Fear City” universe, and the promotional material promised that these comics would interact and give you a fuller reading experience. 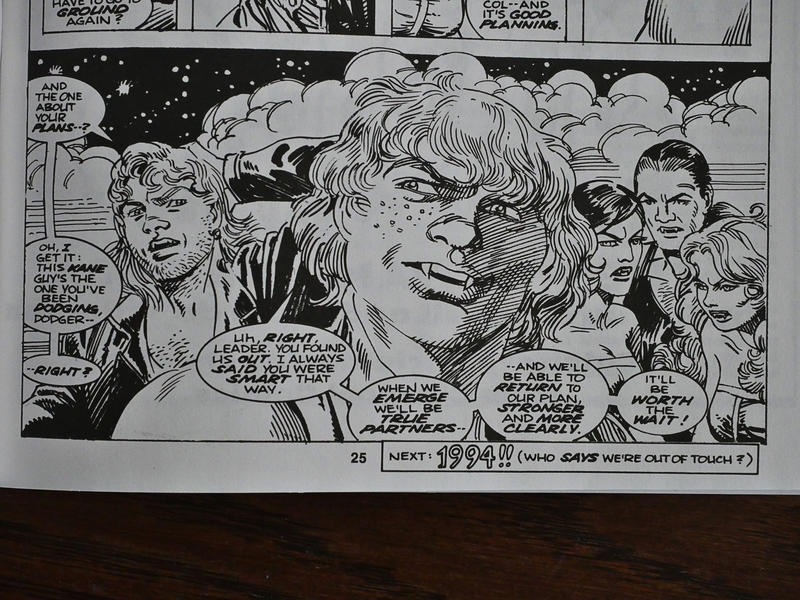 That didn’t really happen much, but you get these occasional references to the other comics. Howell makes sure that we get a full recap of what’s going on in every issue. Some letter writers note the wordiness (and makes comparisons to Portia Prinz). 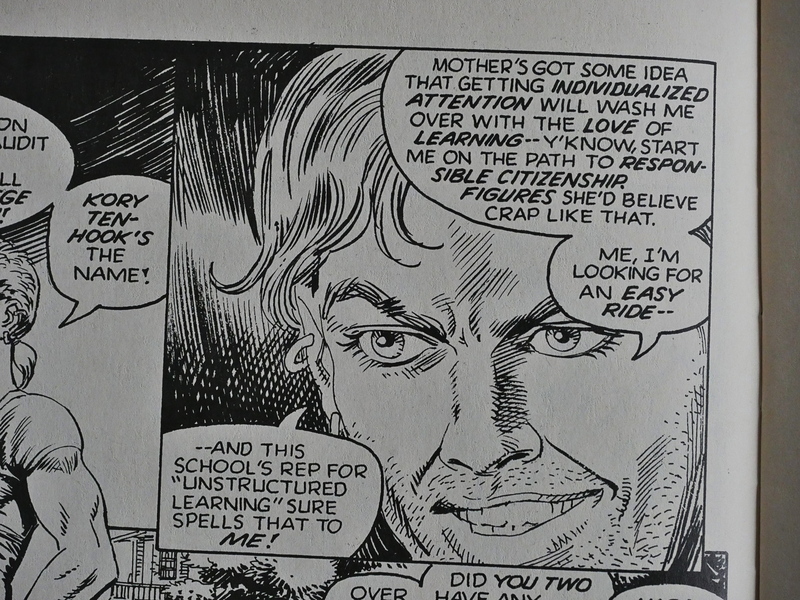 Oh, we get a callback to that initial scene of slaughter and we get to have a gay joke in the book, and also an admonition against noting that there was a gay joke in the book. Self criticism is the first defence against outside criticism. 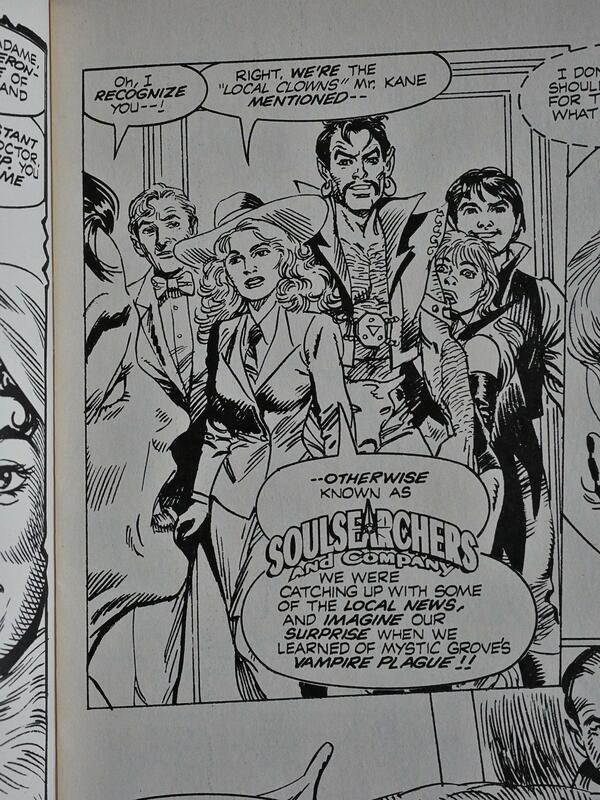 For the first time in the Fear City books, we get a genuine crossover as Soulsearchers and Company show up and actually participates in the plot. Oh, yeah, one of the vampires gets moody and visits his mother. More shades of Buffy the Vampire Slayer, but of Buffy to come. 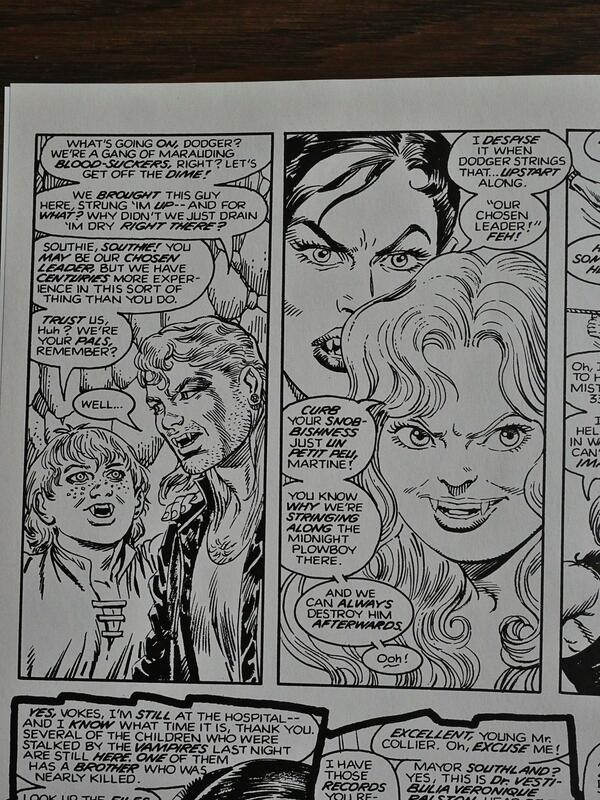 Which makes me wonder whether Joss Whedon, the Buffy creator, ever read this comic book? Because the complex, soap opera plotlines combined with angsty vampires is what that show was partially about. I’m guessing that the plot turned more to this guy as the series progressed? 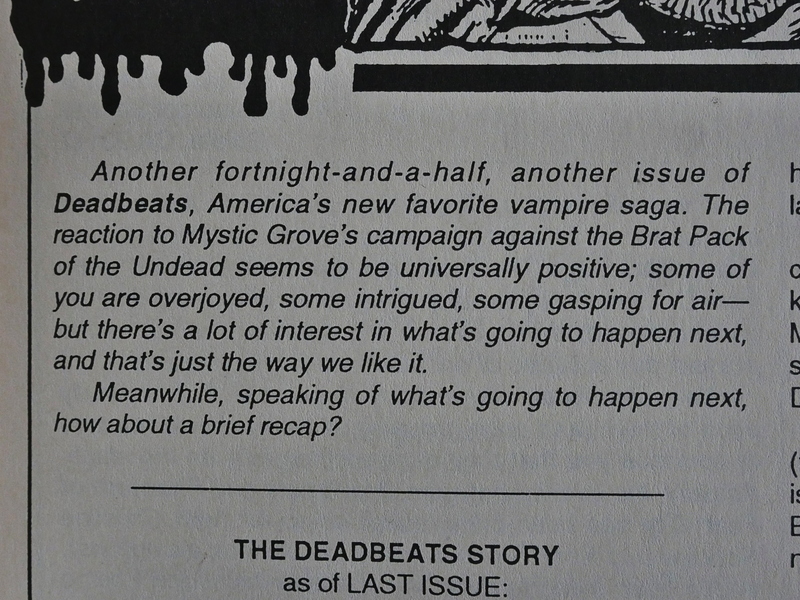 He’s the king of the vampires or something, but it’s only hinted at during the first six issues. 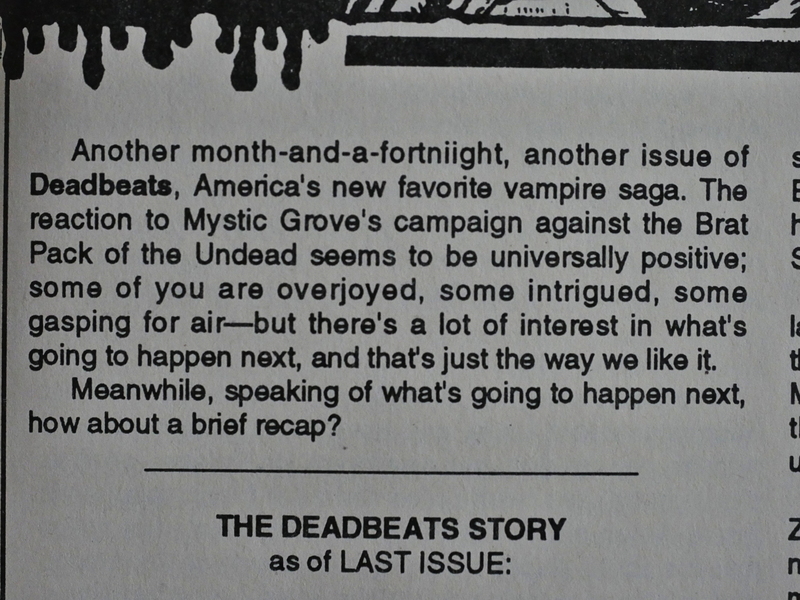 A writer notes that Deadbeats is rather grisly, but it did let off somewhat after the first issues, I think. And here’s where I leave this series, because Eclipse stopped distributing it after issue number six. And I’m not in the least bit tempted to continue to read it, because getting through it was a chore. But other people liked it, and it continued to be published for more than a decade. 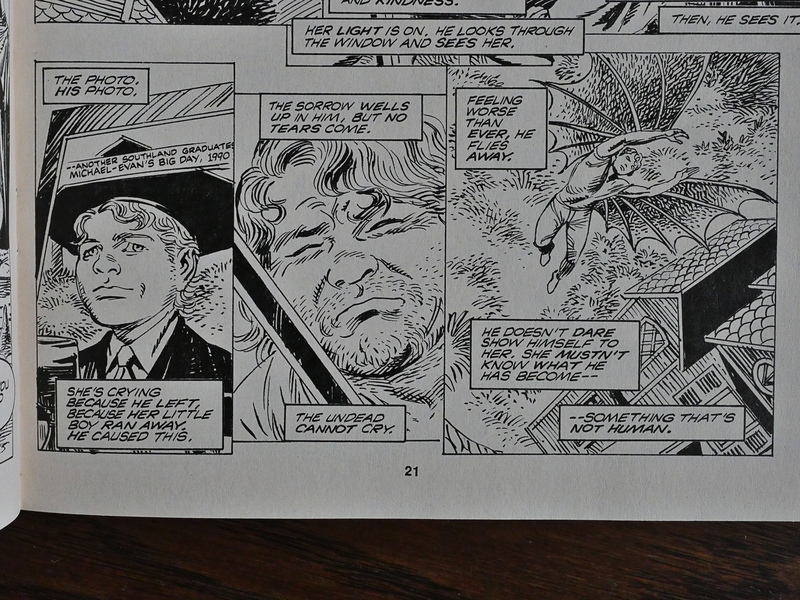 Howell and Villagran remained the creators for an impressive run, and even continues doing the strip online to this day, after Diamond Distributors refused to carry it in 2007. Not because of the content or anything, but because it sold so little that Diamond didn’t find it worth their time to sell it. 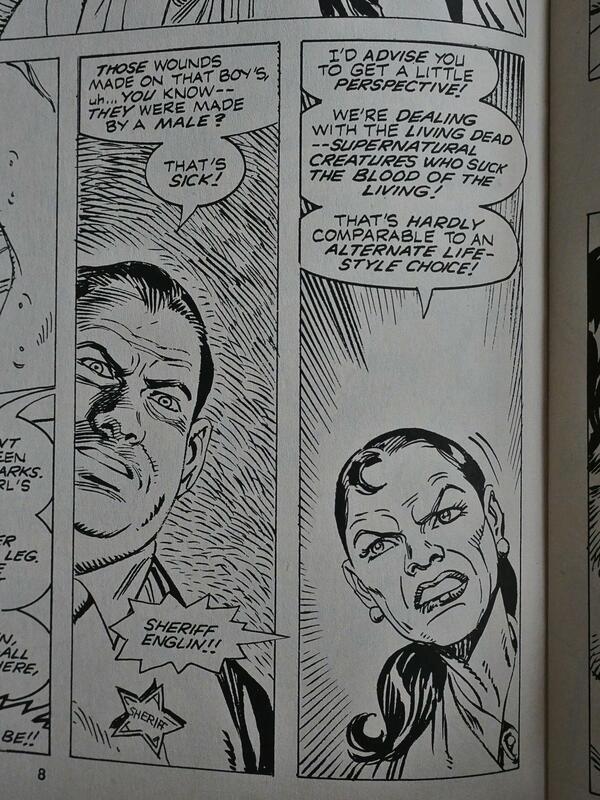 Which I think is rather fascinating: The Claypool books made enough money for the creators to do? But not enough for the distributor? Or is Howell independently rich and subsidised the books? It’s weird. 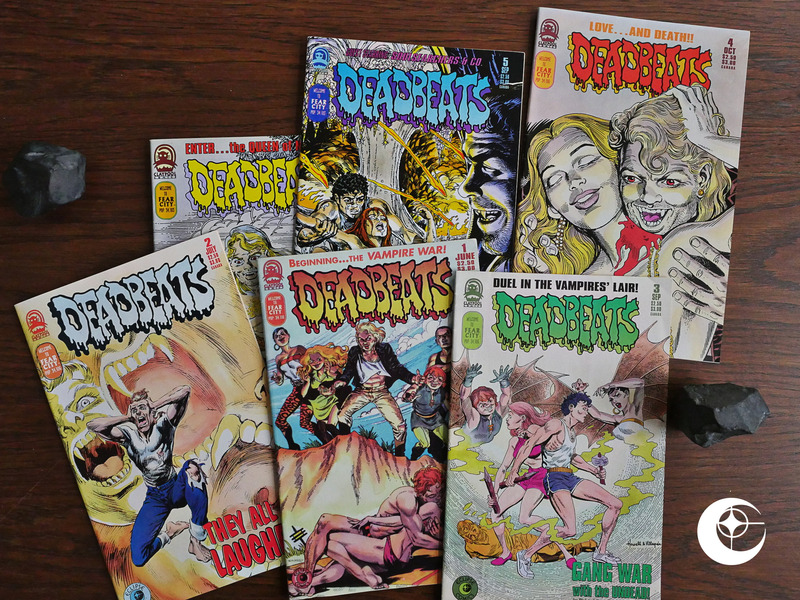 Some of the Deadbeats comics seem to have been collected and republished, but not extensively. 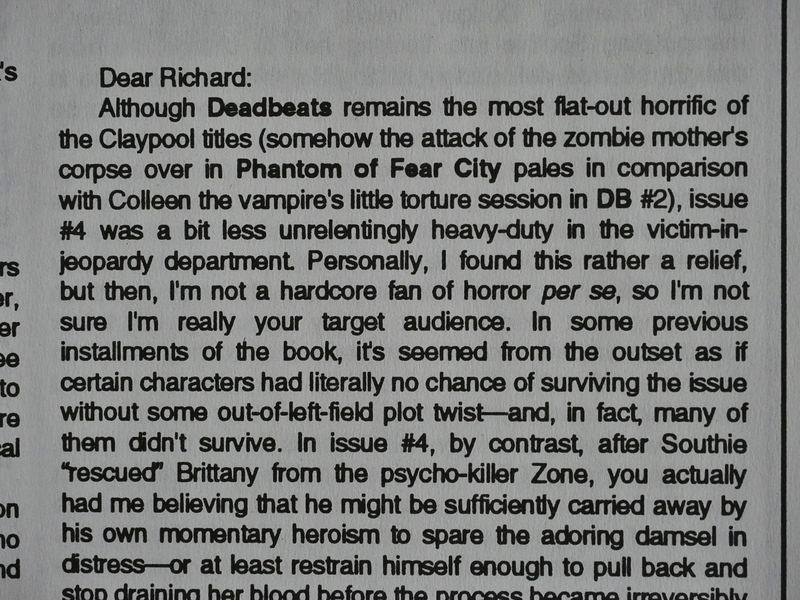 I was unable to locate any reviews of Deadbeats on the internet, even when consulting the Dark Web (i.e., page two and three of the Google search results).